Has your Mom stopped baking for the holidays? Has your Dad let his prized lush front lawn become overcome with weeds? Is your parent no longer participating in tasks that they once enjoyed? Could these be the early signs that they have dementia? Research has found that most often dementia begins as behavioral changes. Recently introduced at the Alzheimer’s Association International Conference in Toronto in July, a group of neuropsychiatrists and Alzheimer’s experts have identified a way to recognize and measure early signs of dementia. This group is proposing a new diagnosis – mild behavior impairment. Often overlooked, behavioral and personality changes can precede the memory loss and cognitive issues commonly associated with dementia and be early signs of dementia. They propose that that mild behavior impairment (MBI) would be a clinical designation prior to mild cognitive impairment (MCI), a diagnosis that describes those with cognitive issues who can still perform daily functions. These researchers created a 34-question checklist that may one day be used to help diagnosis patients at the earliest stage of dementia. These questions could prove to be vital to determining who is at high risk of developing dementia or Alzheimer’s. Has the person lost interests in friends, family, or home activities? Has the person become agitated, aggressive, irritable, or temperamental? Does the person hoard objects when he/she did not do so before? Has the person become less concerned about how her/his words or actions affect others? Has he/she become insensitive to other’s feelings? Behavior changes that may have been excused as a normal part of aging might actually be early signs of dementia. But not all who are experiencing mood swings or changes in their personality are suffering from early signs of dementia. The experts suggest that these changes must be identified and measured over at least a six-month period. This checklist will continue to be tested by researchers until the findings are ready to be given for doctor’s use. 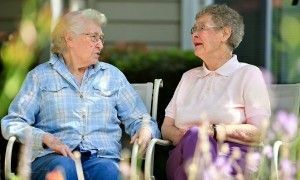 At Aegis Living, our communities are equipped to handle the unique mental and physical limitations associated with memory loss. Our Life’s Neighborhoods ™ are designed to improve the quality of life and enjoyment of our residents. These communities are closely monitored for the safety and care of our residents. Each memory care community includes secured outside gardens, walking paths, chef-prepared nutritional meals, compassionate nursing staff, and caregivers specifically trained to care for those with dementia and Alzheimer’s. If your loved one can no longer live on their own, contact one of our communities today to take a tour.